The internationally-known animal expert will share animal facts and his travel tales during animal shows in Stanleyville Theater, as well as make special appearances at a family sleepover on Saturday night. Hanna’s hands-on approach has won him widespread acclaim as a conservationist, author, television personality and lifelong adventurer. He is best known as the star of the Emmy Award-winning television series “Jack Hanna’s Into the Wild,” where audiences are invited to join him on expeditions around the globe. 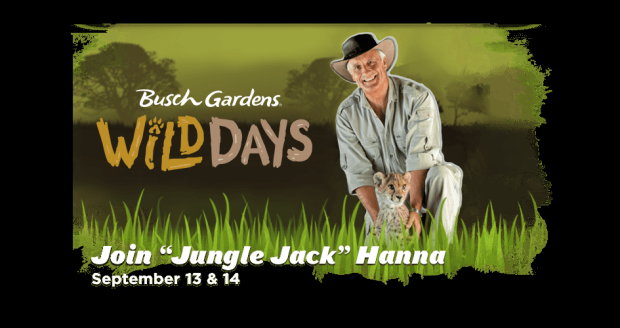 Sept. 13 and 14 at 11 a.m., 1 p.m. and 2:30 p.m.
Hanna returns with his most popular show at Busch Gardens, featuring fan-favorite animals and even some adorable babies. Hanna will share his world travels and educate animal lovers of all ages about the importance of wildlife conservation during shows in Stanleyville Theater. All shows are included with park admission. Sept. 13 from 6 p.m. to 9 a.m.
For park tickets or to register for the sleepover, visit BuschGardens.com.